Located in the center of Rennes, in the heart of the St Hélier district, the residence benefits from the immediate proximity of the shops and cultural places of the city center (national theater of Brittany, cinemas, theater "Le Liberté"). Located 150 m from the railway station, you have direct access to the various public transportations of the metropolitan area (metro, bus, train, vélib). This unique location provides easy access to all the university, college and high schools in the conurbation. 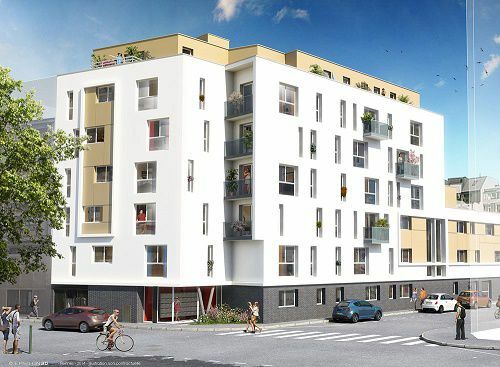 Elegant and refined, with its 73 apartments (58 studios and 15 T1 Bis), the residence offers functional, comfortable and ready-to-live-in apartments. Each apartment is equipped with a kitchenette including, microwave, electric hob and fridge, a bathroom with toilet. With supplements, some apartments offer a terrace (9 M² approximately) or a balcony (1,6m ² about).